Primary six and seven enjoyed a performance called ‘The Journey’ by the Baldy Bane Theatre company this morning. The performance was ‘forum theatre’ which meant that the pupils were able to particiapte throughout the play and were invited to make certain decisions to determine the outcome of the scenes. The key messages of the play were all about road safety. The pupils shared a lot of great knowledge to ensure a safe outcome for all of the characters in the play. The Shetland Islands Council and Police Scotland are running a Shetland wide campaign this week to promote safety outside of schools. As part of their campaign they have spoken to P4-7 pupils at assembly, handed out leaflets to families and erected banners outside of schools. A number of schools have also had small characters outside encouraging parents/carers not to park on yellow or zig zag lines. We are really grateful to all parents/carers for supporting this campaign and parking safely around the school. The photograph below was taken at 3pm on Monday 5 March. 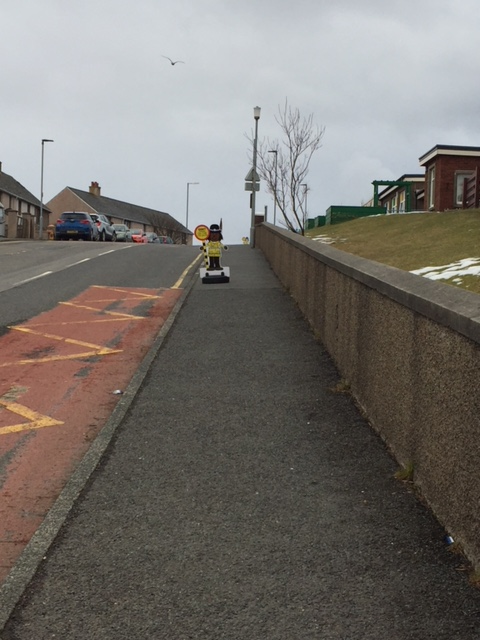 The Crossing Patrol Attendant and pupils couldn’t believe the difference this made to their safety as they crossed the road. They could easily see any vehicles coming.